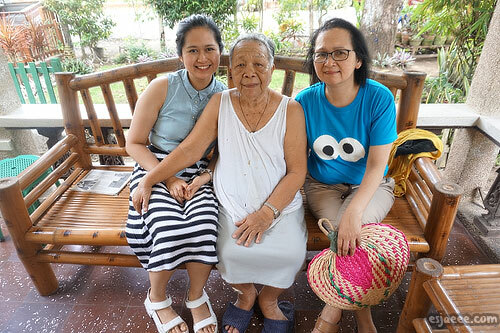 Here's a photo of me with my paternal lola (grandmother) and my mom. It was really such a shame that dad could not come with us to this vacation. This is my cousin from my dad's side Ate (Big Sis) Norlyn. 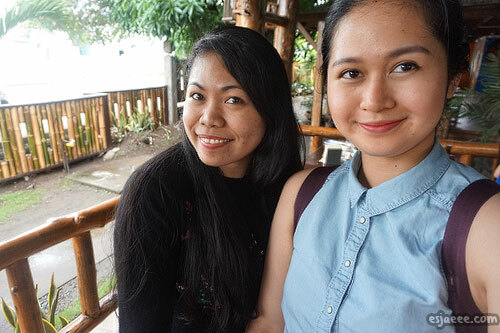 She is one of my biggest supporters when it comes to my blog! 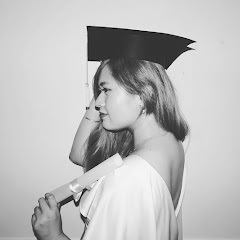 If you are reading this ate, thank you and I miss you! This vacation trip really brought us even closer. Out KakaoTalk conversations were nothing compared to the amount of things we could talk about in person. This is our little troop (squad is such a mainstream term nowadays haha) walking towards the Plaza to eat some street food! 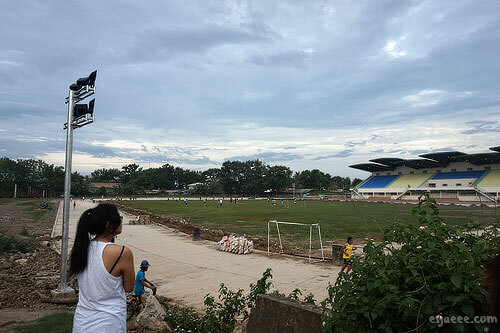 This is the grandstand in Oroquieta that is behind or beside the national high school where my dad attended back in the day. 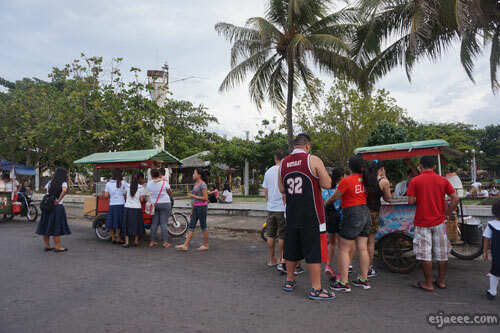 There are a bunch of street vendors in the Plaza. Across this is the sea which is the first photo I posted above. 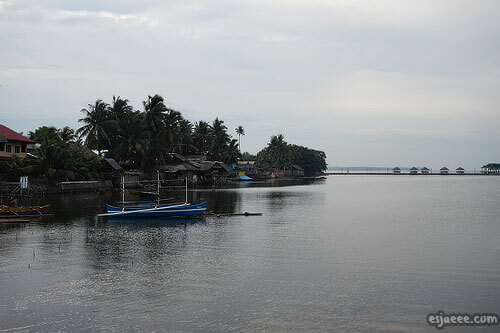 Beautiful right? 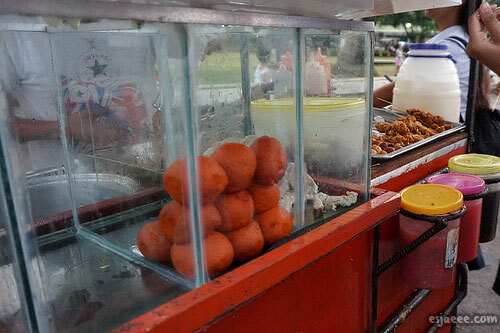 Those orange balls are called tuknene (pronounced as took-neh-neh). they are hard boiled eggs covered with batter with orange/red food colouring. It has its own dipping sauce that is sweet tasting. The sauce could differ within difference places. 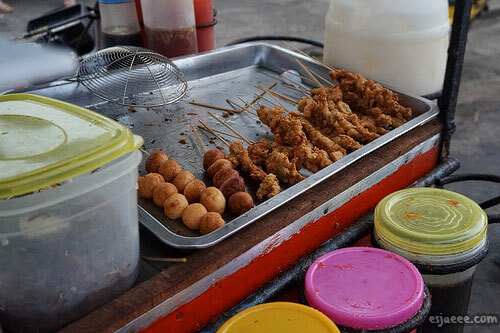 Those things on skewers were fishballs and kikiam. 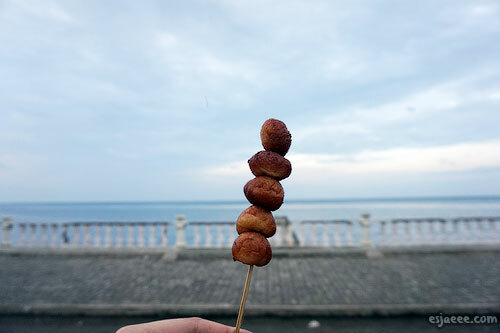 Fishballs are ground fishmeat formed into balls and kikiam, according to Panlasang Pinoy, is a sausage-like street food. 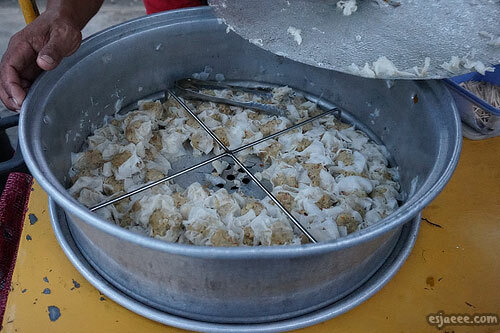 This can be made from seafood such as ground shrimp, fish or pork. My cousin got kikiam made from fish and I was delighted it did not have shrimps in them! 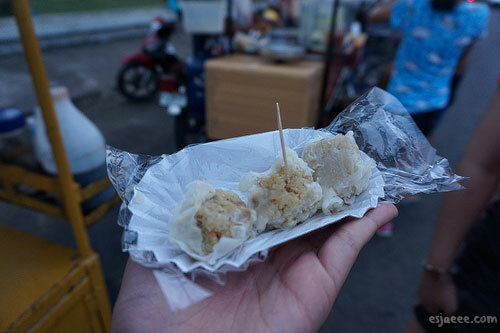 Then I got fishballs! They were SO good! 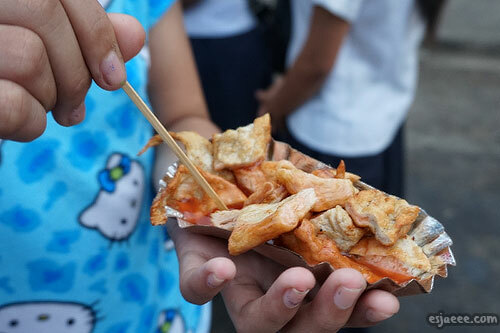 The I got a tiny disposable plate of pork siomai. Thank you Ate Norlyn for such a treat! 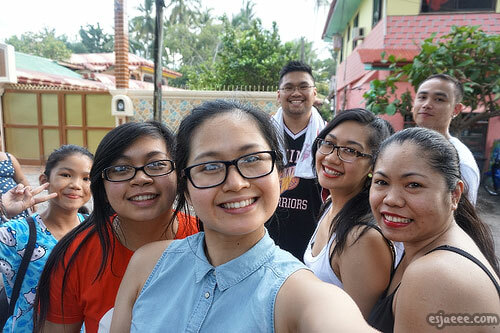 The next day, we decided to go and have dessert at Chicken Ati-Atihan. 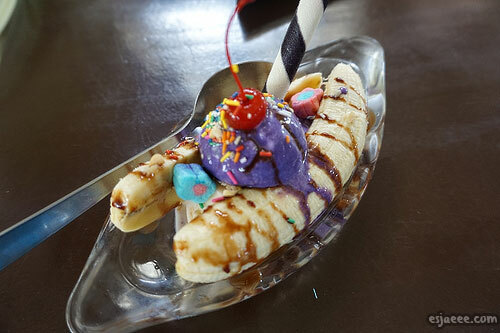 My sister got their banana split that was served with ube/taro ice-cream and one Stick-O. We also got milkshakes of course! These milkshakes are not typically found in Ireland! 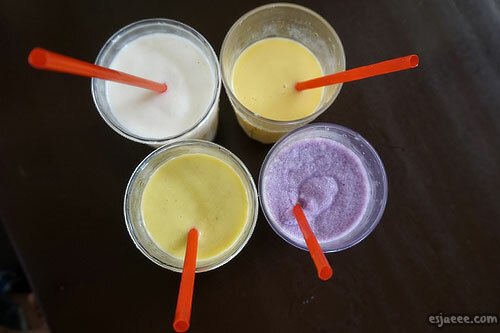 The white one is the guyabano/soursop milkshake, the yellow ones are mango milkshakes and the purple one is ube. 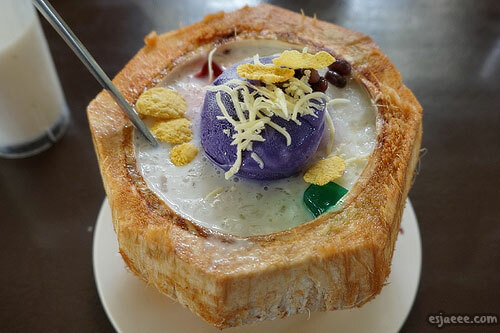 This restaurant is known for their halo-halo served in coconut shells with fresh coconut "meat" inside that you scarpe off while eating this. This was delicious, I tell ya! So that's our food adventure while we were in Oroquieta. You think it is just so little? Well, we had more foodie trips that I did not get the chance to take photos of. I'll see you beautiful earthlings in my next post! Have a good week ahead! Watch my vlog composed of little clips of our adventure in Oroquieta City and Kolambugan. I am still in the process of editing the Kolambugan post so stay tuned! Also, don't forget to subscribe to my blog so you wouldn't miss out on future updates!